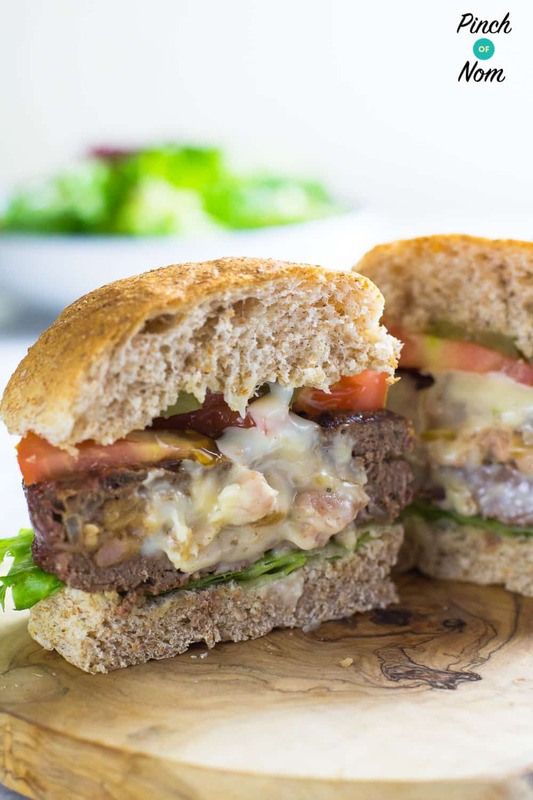 Our Stuffed Burgers feel so naughty yet are 100% guilt free! 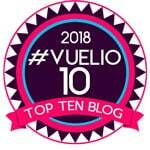 Enjoy them when counting calories, or following plans like Slimming World and Weight Watchers. I do love a Bank Holiday weekend, time to make tasty things on the BBQ! 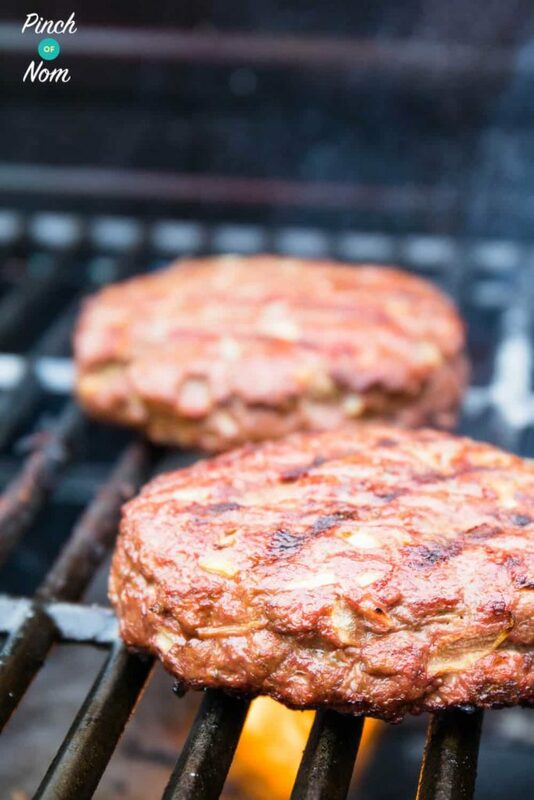 We cooked these Stuffed Burgers on our Char-Broil Gas2Coal BBQ. 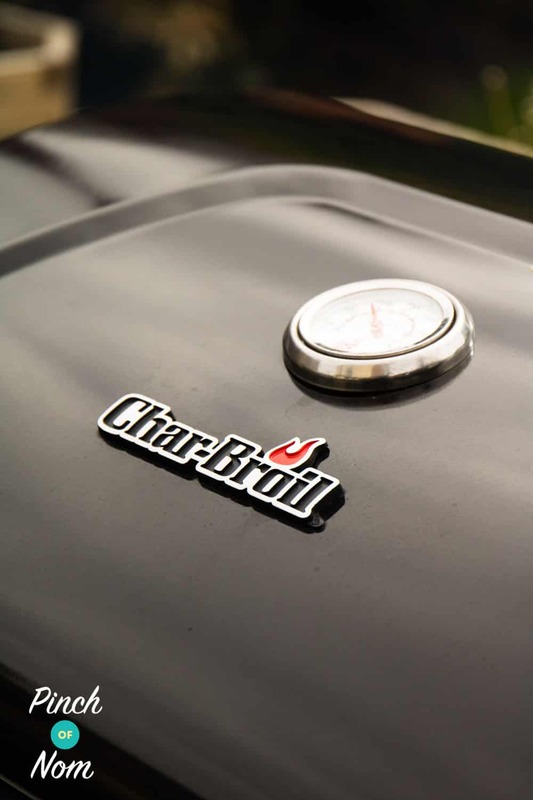 The Char-Broil Gas2Coal BBQ is pretty special, in that it runs on gas and on charcoal. So you can get that lovely smokey flavour, without any of the effort that usually goes into starting a charcoal BBQ. 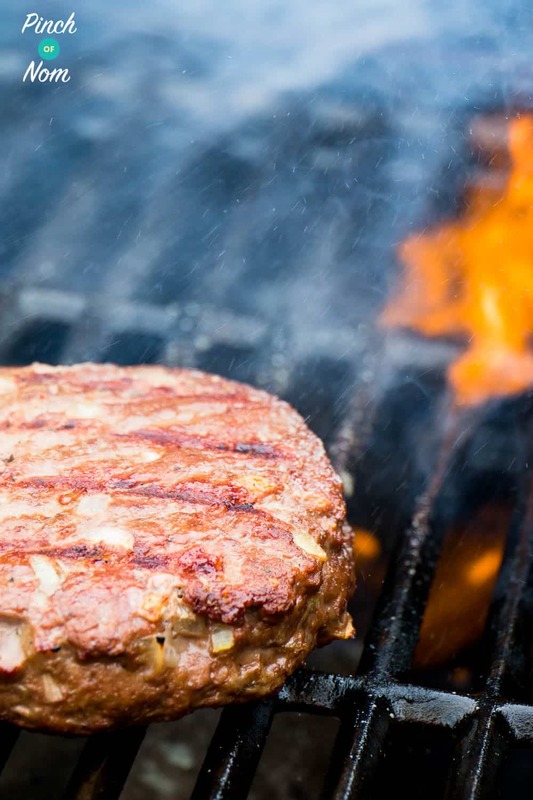 The Char-Broil Gas2Coal BBQ makes cooking these Stuffed Burgers an absolute dream! All you do is load up the tray of the BBQ with charcoal, light the BBQ with the gas, then 15 minutes later you’re ready to go. 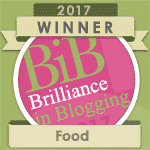 We’ll have a review of the BBQ up very soon, well worth it if you’re looking for a new BBQ this year. The secret to making these Stuffed Burgers! 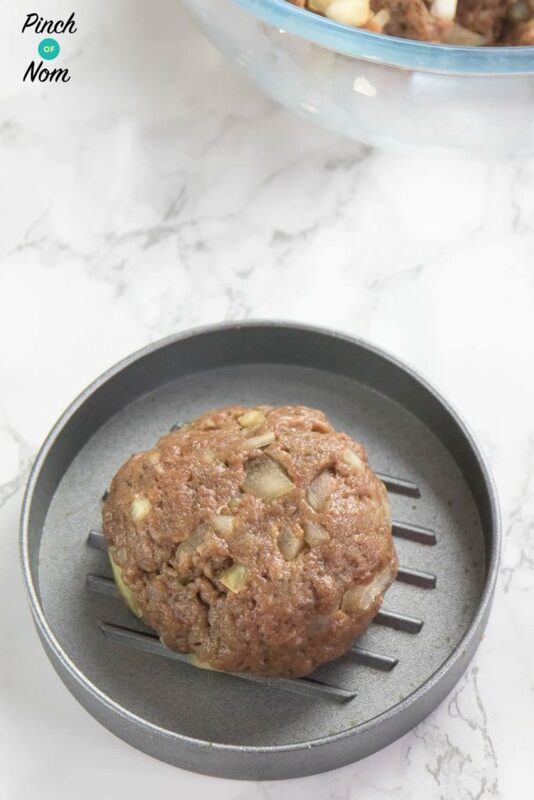 Making these Syn Free Stuffed Burgers is pretty easy too, especially when you use one of these burger presses. They’re far superior to some of the cheap plastic burger presses you see knocking about and much safer to use too! 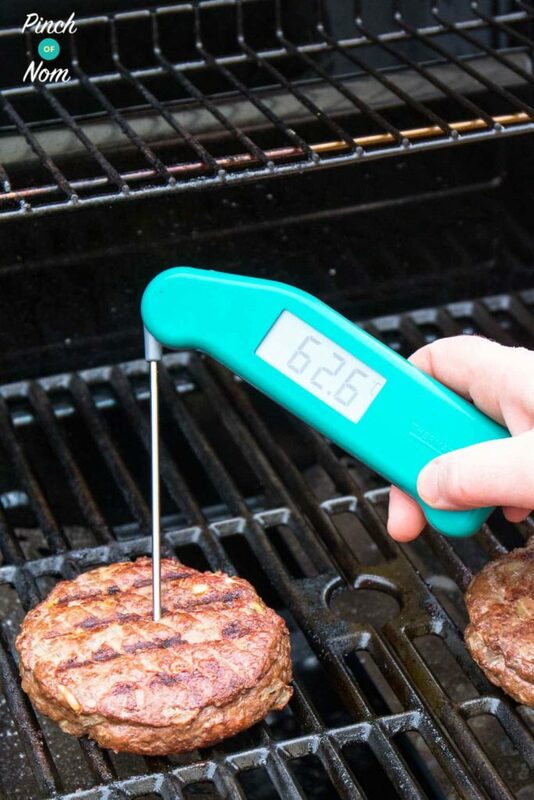 How many calories are these Stuffed Burgers? These Stuffed Burgers are only 373 calories per portion. Compare this to 563 for a Big Mac and it’s a great saving! 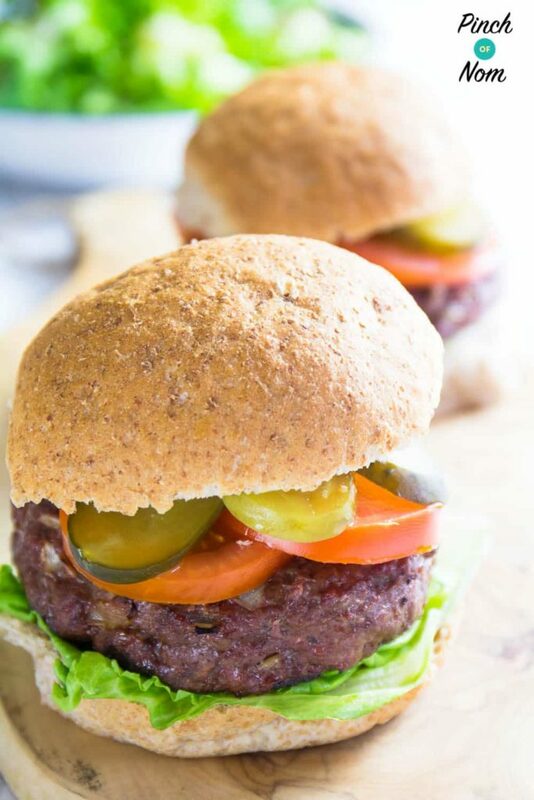 How many Slimming World friendly are these Stuffed Burgers? 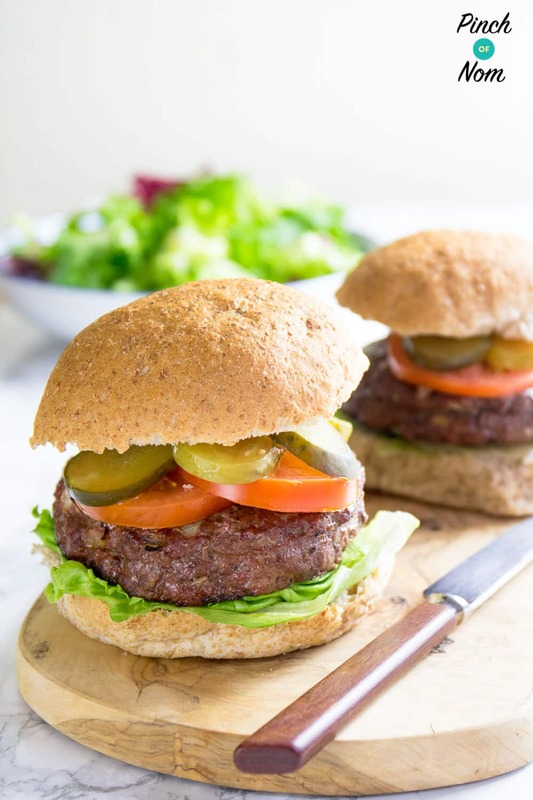 These Stuffed Burgers are Syn Free if using your Healthy Extra B choice for the bun, and 1/4 of one Healthy Extra A choice for the cheese. How Weight Watchers friendly are these Stuffed Burgers? These Stuffed Burgers are only 7 Points, and worth every delicious one! 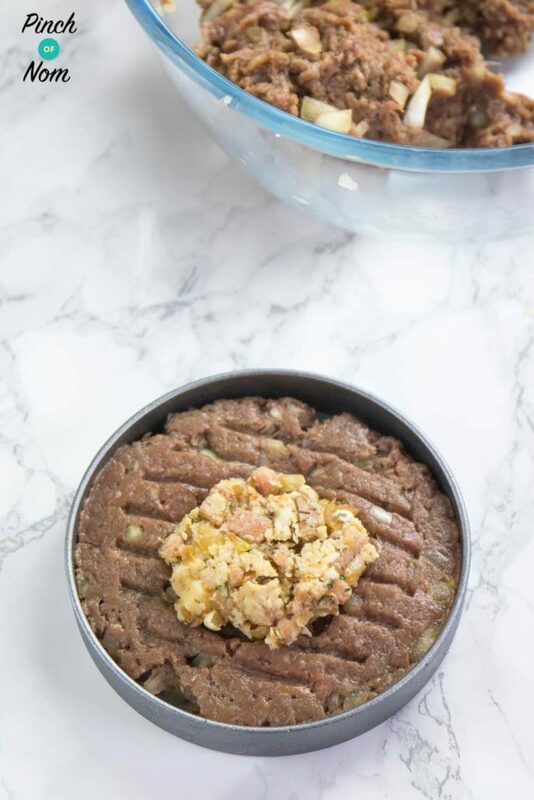 How do I make these Stuffed Burgers? 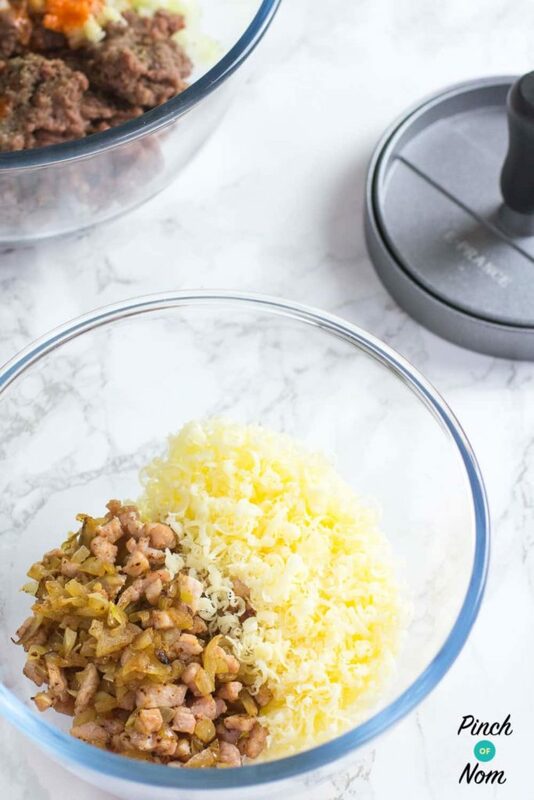 Scroll down to the bottom of this post for full ingredients list and instructions. Cut the bacon medallions into small pieces and finely dice the whole onion. 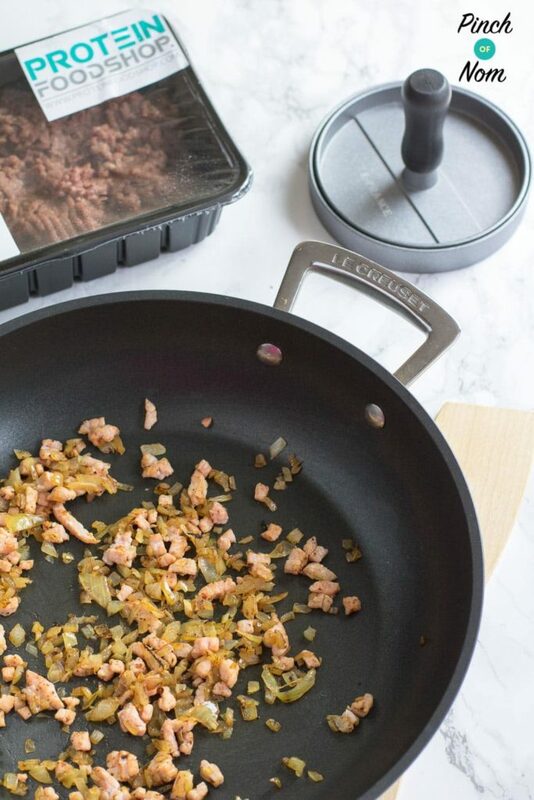 Mist a pan with some low calorie cooking spray, then cook the bacon and half of the onions until they are cooked through and lightly browned. Set aside to cool. 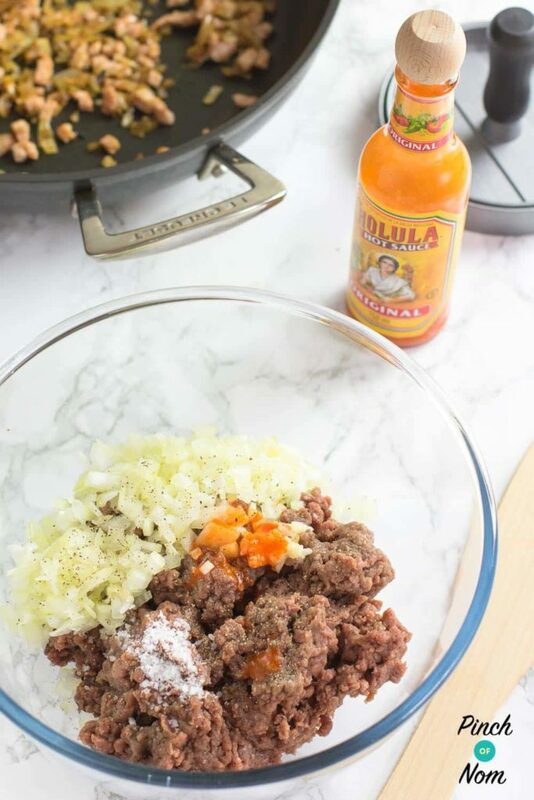 Mix the minced beef, remaining onions, garlic, salt pepper, hot sauce and egg together until it’s all combined thoroughly. Return to the cooked onion and bacon and stir in the cheese. 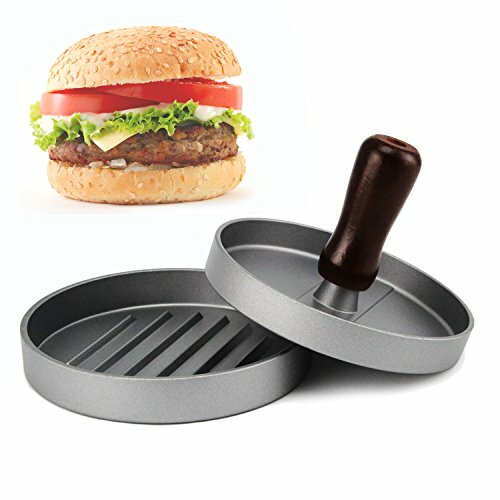 Split the burger mix into 4 equal balls, then put one ball into the burger press. 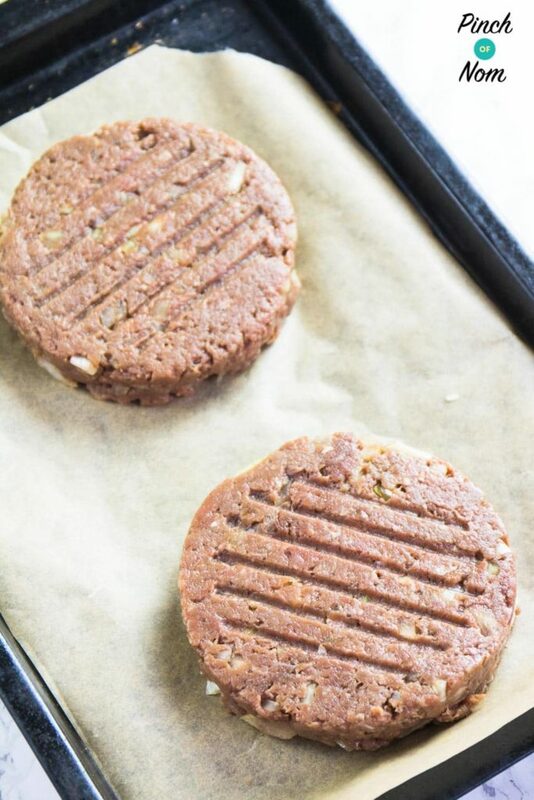 Replace the lid and press down firmly – you should now have a thin burger in the press. Make an indent in the middle of the burger, then add half of the cheese mix. Take another ball of burger mix and flatten it slightly. 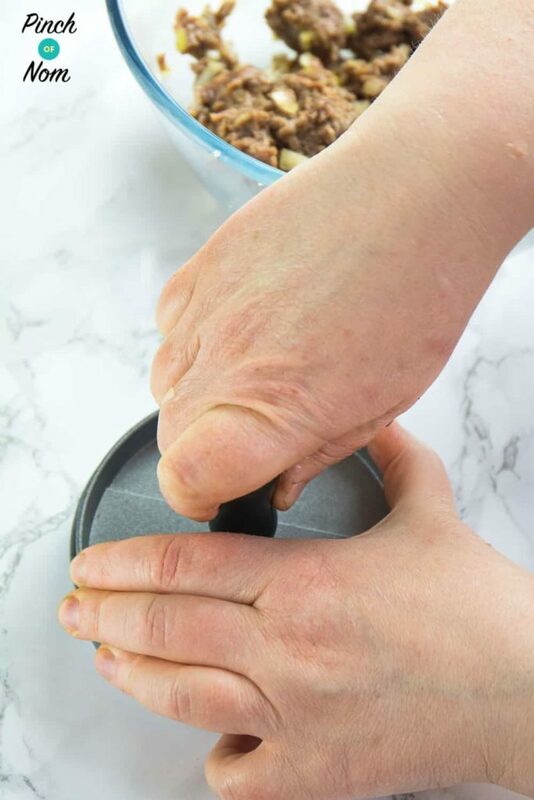 Place it on top of the cheese mix, then replace the lid and press down firmly. Remove the burger from the press and repeat with the remaining burger mix and cheese filling. Place in the fridge to firm up for 30 minutes. 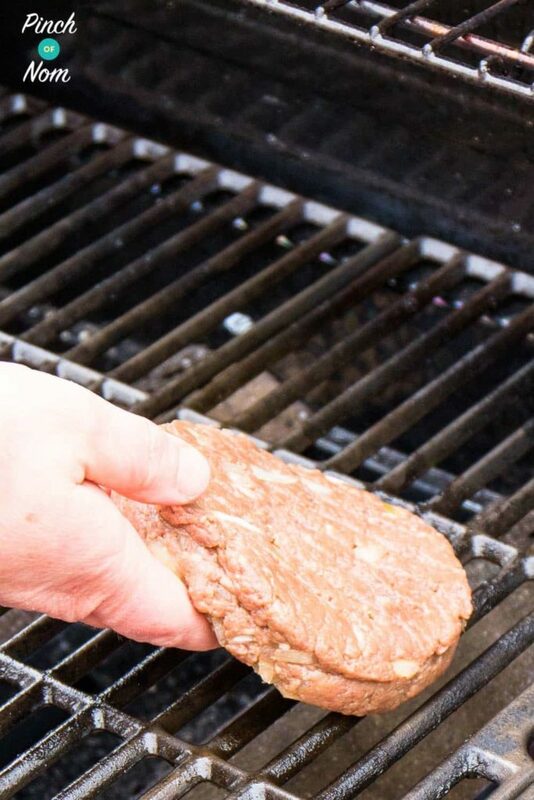 Spray both sides of the burger with some low calorie cooking spray (so it doesn’t stick to the grill bars) then place on the BBQ. Cook for 5 minutes, then turn and cook for another 5 minutes. 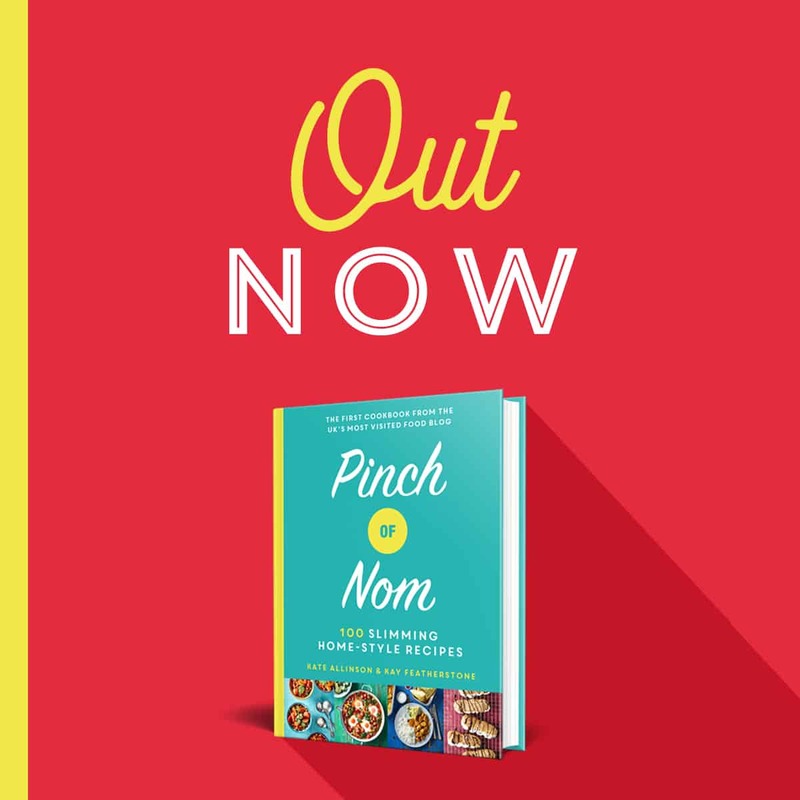 We used served it on a 60g wholemeal roll, but you can use whatever roll you want – just adjust the Calories, Syns or Points accordingly! Can I cook these in the oven? If so what temperature please? 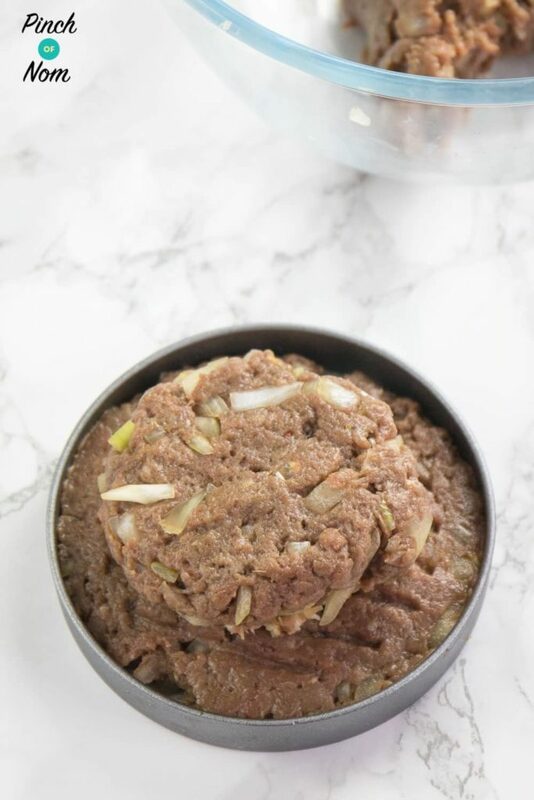 If the turkey mince was raw when defrosted, you can freeze it now it’s been cooked. When you want to defrost the burgers, do it in the fridge overnight, then reheat thoroughly until piping hot. Hi Can I use Quorn mince for these burgers instead?